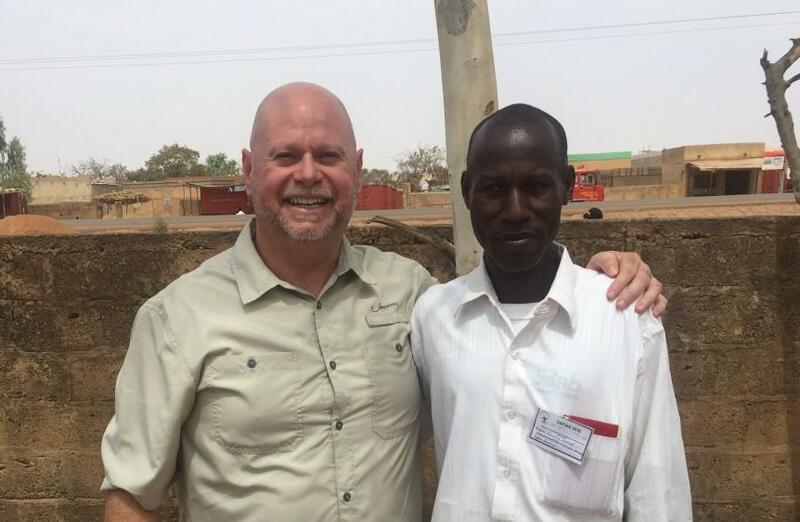 It was just two weeks ago, February 11-21, 2016, and once again I was in the country of Burkina Faso. I was there to help lead a group of church leaders in a National Leadership Conference with the International Leadership Institute. My prayer was that those in attendance would be more equipped to lead and mobilize their churches to carry out the great commission of Jesus-sharing HIS message of hope with the world. My challenge was for them to become a leader of leaders. We would teach them some core values and principles of effective leadership to help them in their journey. Burkina Faso is one of the poorest countries in the world, located in the sub-Saharan region of West Africa. It is also one of the most “un-reached” with the gospel, having portions of several unreached people groups within its’ borders. As a pastor, I have taken several people there as part of their discipleship journey. I went for the first time in September 1991. We have served in a variety of ways including: evangelism in remote villages, Vacation Bible Schools, Family Life Training, Medical Services, Small Groups Training, etc. Yes there are some dangers. Just a month before our arrival on this trip, people identifying themselves with the terrorist group ISIS came to the country from Mali and attacked a restaurant and hotel, leaving over 30 people dead. In my experience the people of Burkina Faso are a gracious and kind people, but the environment in which they live is an extreme place that can push the body, mind, and soul of a westerner to its limits. The airborne dust can be tasted with every breath. The heat from the desert sun pierces through every possible shade, and the fear of an intestinal parasite accompanies every bite at mealtime. Once outside if it’s capital city of Ouagadougou, the comforts of familiar food, air conditioning, and warm showers are conspicuously absent as a primitive world makes its appearance. It is the perfect place to take North Americans to be on mission. It makes a person feel that they are at “the ends of the earth”! Sometimes people question the long-term value of such trips. Are they simply self-serving, helping to sooth our guilty consciences for having amazing wealth? Are there any ongoing spiritual benefits? Is it simply too dangerous and risky? I only know that everyone who has gone has come back with a better understanding of their own role in God’s kingdom, a deeper sense of gratitude, and a greater passion to carry out the Great Commission. And I also know that God uses our simple efforts to expand HIS kingdom. On the second day of my Leadership Conference one of the participants came to me with an interpreter. He was pastor of the only church in the remote village of Pofna. In his tribal language and with a smile he told me I had baptized him 25 years earlier in 1991. 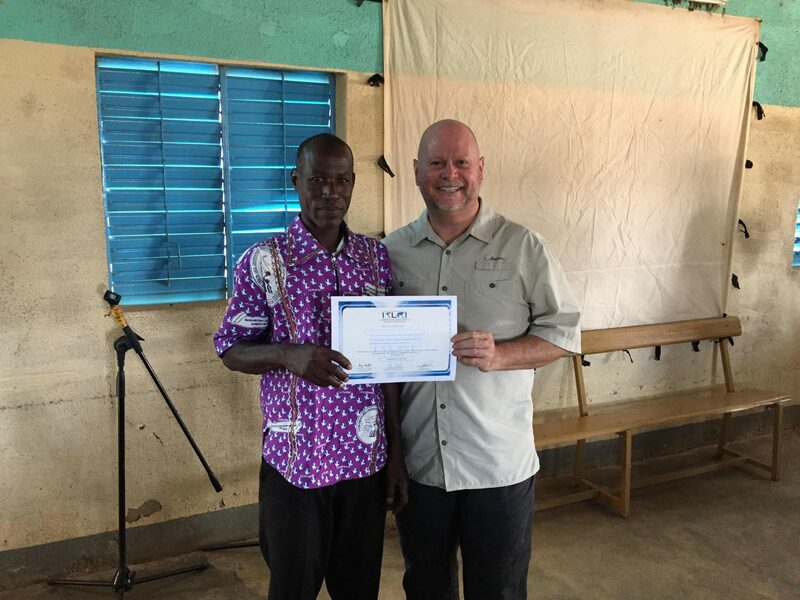 Now he is a pastor and is planting churches in surrounding villages. He’s been training people to share their faith with others. And he was excited to attend and later graduate from the Leadership Conference I was teaching. He was making a commitment to go back and invest the principles and core values into the lives of others. He was committing to become a leader of leaders! After our conversation I took some time to reminisce and reflect. We had first met when I was 26 years old and he was in his early 20’s. I am now 51 and both of us have fewer years in front of us than we have behind! We had shown the “Jesus Film” in his village and most of the people had never seen a movie before. 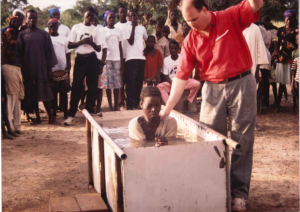 Many gave their lives to Jesus and I baptized 42 people in a mobile baptistery we had taken. We were several hundred yards from the nearest well, and I watched them carry water in buckets on their heads to prepare for the baptism. On that trip, I got bit by a desert blister bug, from which I had a scar for over a year. I slept in a mud house on a dirt floor, and ate guinea eggs for breakfast. It was an amazing experience, but I had no idea how God would use our efforts to expand His kingdom. I did not comprehend the depth of what God was doing inside of me. Today I understand that mission is not simply something I do occasionally. It’s who I am every day! 1. Time and life will pass whether we use it wisely of not. Invest wisely! 2. We are God’s tools in His greater plan. Live with eternity in mind! 3. Our obedience and involvement in God’s plan matters. Our life is not our own! 4. There is a world that is bigger than our own. Live with eyes wide open! 5. Investing in others changes our lives and theirs. Invest every day! 6. Today might be our last. Make today count!